Good side dish for curd rice, sambar rice or rasam rice..
Heat oil in a kadai, add onions with a pinch of salt and sauthe it until brown color. Add green chillies and sauthe for a while, add the chopped tomato and sauthe it. Add ginger & garlic paste and sauthe it until the raw flavour goes. Add chicken, chilly powder, curry leaves, corriander leaves, salt and water and close with a lid. Once the chicken is done add 6tsp of roasted & powdered ingredients, stir it and cook it for few minutes. Garnish with corriander leaves and drops of lemon juice. This was very tasty and just the right amount of spices. Thanks you. Hello Rajesh your recipes are very good, Not to many masalas which destroys the original taste of the food, Keep it up. Thanks you. 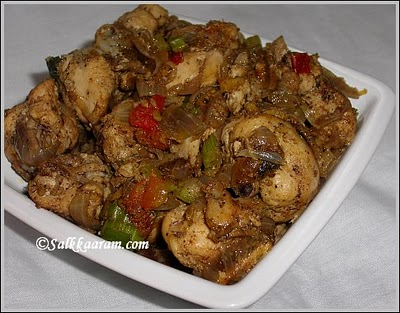 Mmmm!.Smells good like Chettinad Chicken Fry. interesting recipe man good work Mr Raj. Thankx. Nice & easy thanks rajesh.